I looked at the clock in horror. How could it be 4:30 already? My husband would be coming home soon, and I had to feed him and eight kids at 5:00. What to do? Thank goodness I write for Keeper of the Home. Knowing I had this “Thirty Minute Dinner” assignment coming up, I had a few ideas swirling around in my head. All I needed was that golden opportunity, and why, here it was, slapping me in the face like a friend with good timing. I actually have a stash of last minute dinners waiting in the wings. Life happens, right? And not always the way we plan. Pre-browned hamburger/ground turkey. I brown bunches of this with sweet vidalia onions and green peppers and then store in family dinner sized portions. Cooked wild rice for quick wild rice soups. Cooked brown or long grain rice for quick casseroles, burritos, soups, etc. Cooked and chopped ham and bacon for quick egg and potato dishes, real macaroni and cheese, sandwiches and other casseroles. I could go on, but you get the idea. I’m not a freezer meal kind of gal. Tried that and just couldn’t get into the flavor and texture of most of the finished meals after they had been frozen. But having some of the components of a meal ready to go enables me to whip up fresh, great tasting meals…lickity sizzle. So let’s make some FAST chicken enchiladas, shall we? 1. Pre-heat oven to 400 degrees. We want that baby HOT. Throw a stick of butter in a small saucepan and start melting it on your stove top. 2. Clear a working space on your counter top (this is important when you are in a mad rush) and slap 8 large tortillas down. The slapping part just feels good. 4. Roll up the tortillas and place, seam side down, in a large baking dish. 5. Add 1/2 cup of flour to the melted butter and stir/cook for 1 minute. 6. Whisk in 1 1/2 cups of chicken broth and cook until thick. 7. Add a small can of chopped green chilis and a cup of sour cream. 8. Pour sauce over the top of the enchiladas. Sprinkle with more cheddar cheese. 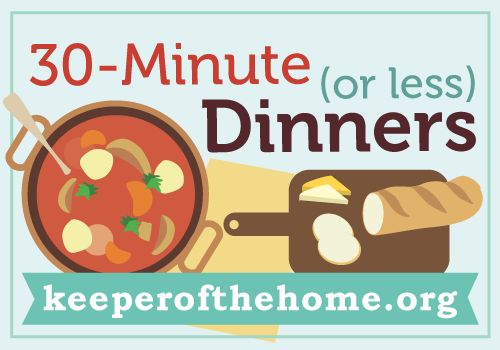 What are your favorite 30-minute or less dinners? Glad to know that I’m not the only one who just doesn’t care for freezer meals. Thanks for the post. One thing my kiddos love that’s super quick is corn chowder: saute up some finely chopped onion in butter, add some other very finely chopped veggies such as red pepper, zucchini or maybe some grated carrot, along with a cup or so of chicken/veggie stock (or water if you don’t have stock handy.) Simmer until veggies are tender, then add one or two cans of creamed corn (talk about yer blasphemy!) and an equal amount of milk. Stir constantly until heated through. Serve with biscuits slathered with butter. If you want to be fancy add some chopped chives to the biscuit dough. If you want the meal to be more substantial you can add cheese to the chowder towards the end, or even some chopped ham. Yes, that sounds like my kind of meal, made from bits of this and that stored in my freezer. Yesterday my husband was fixing the dishwasher at 5 PM, so Miss 12, whose turn it was to cook, couldn’t putz around in the kitchen like usual. So she thawed some sausages (in hot water) and sweet-talked her brother into barbequing them. Then at the last minute she thawed some brown rice (in the microwave) and quickly made a batch of delicious brown rice, with parsley she picked herself, including bits of grass. 🙂 She put together a veggie tray, pulled out some left-over peas and salad, and there we had a delicious supper. It would have been done in half an hour if we hadn’t run out of propane for the barbeque. LOL! There’s always something to thwart our best efforts…!!! This looks absolutely delicious. I cannot wait to give it a try. Thank you for putting this blog together… I love it! I love your humor in this post, Natalie! I’m glad I’m not the only one who looks at the clock at 4:30 (or later!) and wonders what I’ll make for dinner! I’ve gotten really bad during this pregnancy! 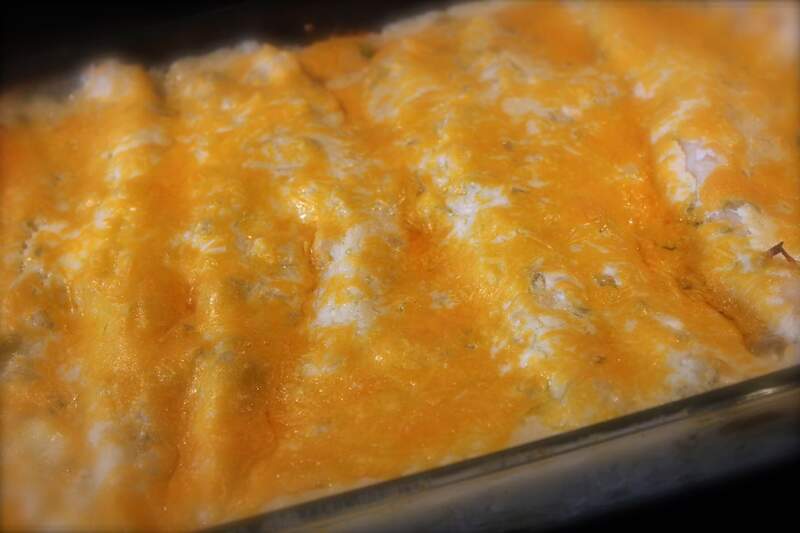 I absolutely love enchiladas, and this recipe looks delicious–not to mention super easy! Yum! I love mexican food! And I am a late dinner planner gal too lately! I’m working on getting my plans to better but has been hard with our new business. Thanks for making me feel better about committing food “blasphemy”! As much as I wish I could have better eating/cooking habits, being a full time working mom means I have to use the microwave and rotisserie chickens and canned food more often than I want to. At least it’s better than getting fast food. These would be good with black beans added in! Yum! 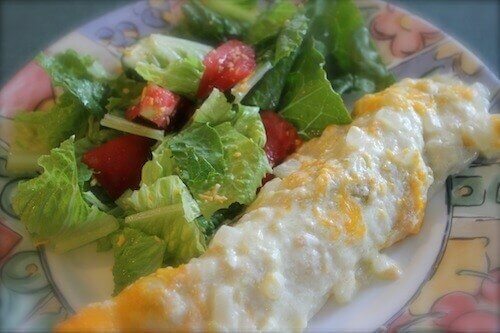 I’m thrilled to see an enchilada recipe that does NOT use enchilada sauce from a can! I may just try this one tonight. Morning sickness hit hard last week and cooking is the last thing I feel like doing! Thanks!! Simmer for about 20 min., adding water if mixture gets too dry, until rice is cooked and fluffy. 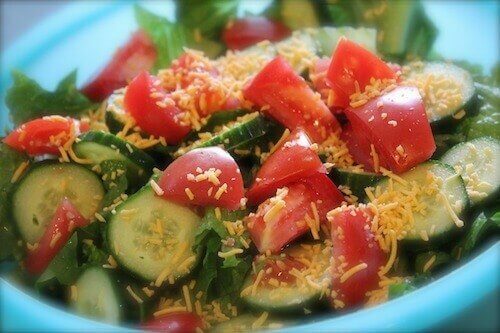 Serve with mandarin oranges or a salad. Ah, this is what I have been needing to find out about freezer meals. I have been resistant to freezer meals for various reasons, but just freezing some core ingredients like meat and beans makes sense. I have been exploring other ways to make quick, simple meals and have been surprised by how truly simple meals with just a few ingredients are so good and feel good after eating them. great idea, thanks. I have started storing more in the freezer for use with quick meals: beans, meats, stock, etc. I see you thaw in the microwave (I use my microwave a lot myself) but then I’m curious what kinds of containers you store things in? I haven’t yet found anything I’m all that happy with, and I don’t like microwaving the plastic ones I do have, so I let stuff thaw in the fridge and have to remember to plan far enough ahead. I agree about having short cuts in the freezer. I too have cooked beef and chicken to make meals quicker and easier. My favorite is with chicken. I boil whole chickens, and debone. I put that “shredded chicken” into a bag. On a day I need a meal in minutes I take it out, microwave it and add BBQ sauce. “Taco Rice” is another one that is super simple 1 lb of browned hamburger, 1 can of Rotel tomatoes, 2 T taco seasoning, mix it altogether and put it on a tortilla shell with cheese. I got that one from Lynn’s Kitchen Adventures.